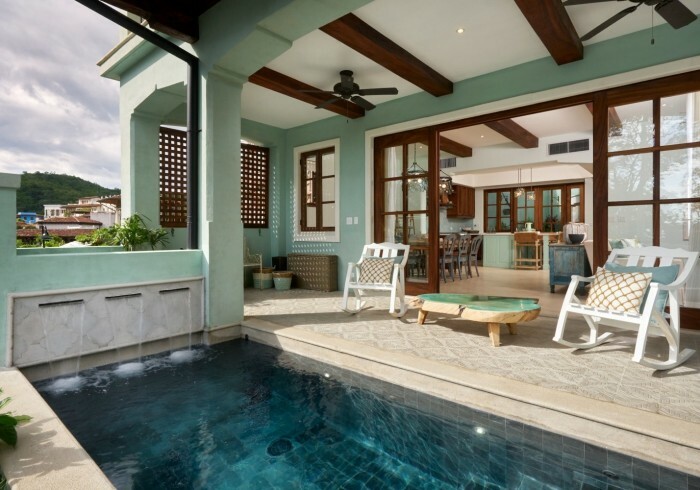 21 Calle Cartagena is a 5 bedroom home with capacity for up to 12 guests. The home is located on Calle Cartagena very close to the Beach Club. The magnificent oceanfront location of the home became the inspiration for the interior and exterior design elements which were perfectly executed by Panamanian architect Ricardo Arosemena and interior design by, Andrina Fonseca. The home reflects the colors of its environment and is very calming, comfortable and unpretentious. The living room offers comfortable seating directly off the pool deck with a sleeper sofa. A wooden armoire opens up to a 50’’ flat screen smart TV. The Guanacaste slab dining table and kitchen islands seats 12 guests and the outdoor patio and front terrace offer more seating space. The Guest Bedrooms on the second level share a spacious balcony with ocean views and plenty of seating space for relaxing or dining. One of the bedrooms has two single beds or can be joined to create a queen bed with a shared bathroom with the kid’s bedroom with two bunk beds. It also has a “secret” door and stair for access to the 3rd floor “parents” bedroom above. There is a TV and DVD player. The other second level guest bedroom has a queen bed with an on suite full bathroom.The third level of the house offers a guest bedroom with a King bed, spacious closet, Juliet balcony and an on suite bathroom with shower/bathtub. The Master Bedroom located has a King bed with panoramic view of the ocean and Beach Town. The bathroom has a dual vanity and an ocean view shower. This bedroom has a lot of natural light flowing into the room allowing a relax atmosphere, the light can also be controlled with shades on all of the handcrafted French doors. The private terrace also offers a tranquil Zen garden with a fountain and living wall. The covered balcony offers a daybed, comfortable seating and an oversize hammock.